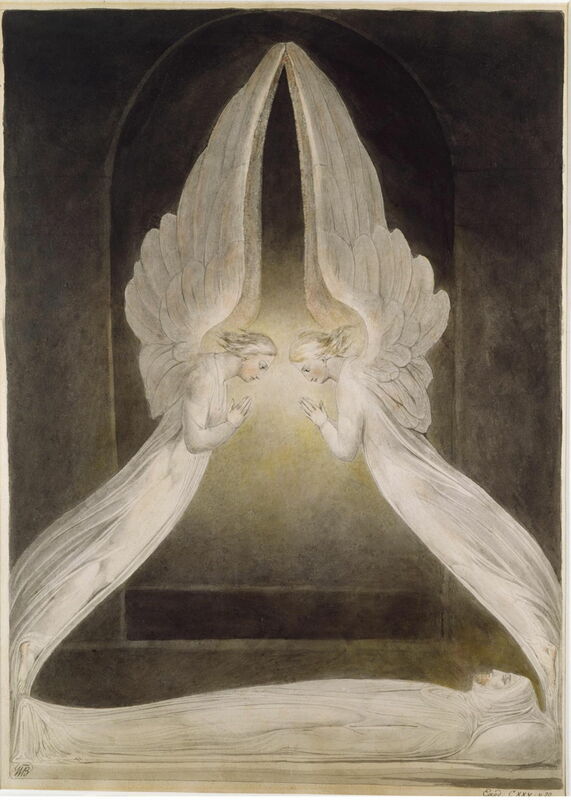 William Blake (1757–1827), The Angels hovering over the body of Christ in the Sepulchre; Christ in the sepulchre, guarded by angels (c 1805), watercolour, pen and ink on paper, x x y cm, Victoria and Albert Museum (Given by the heirs of Esmond Morse), London. Image courtesy of and © Victoria and Albert Museum, London. 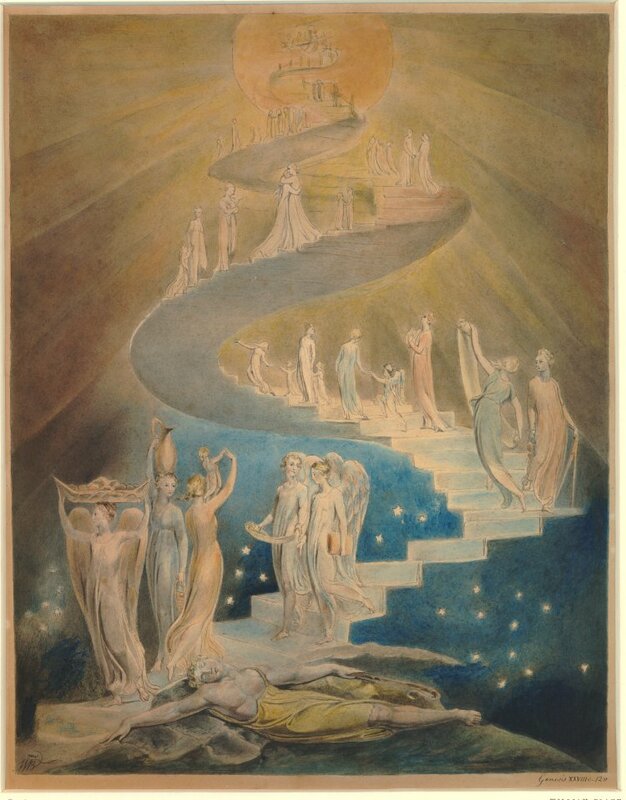 For all his extraordinary artistic vision, William Blake had a strong sense of design, developed during his apprenticeship as an engraver, and honed when he was self-publishing his illuminated books. 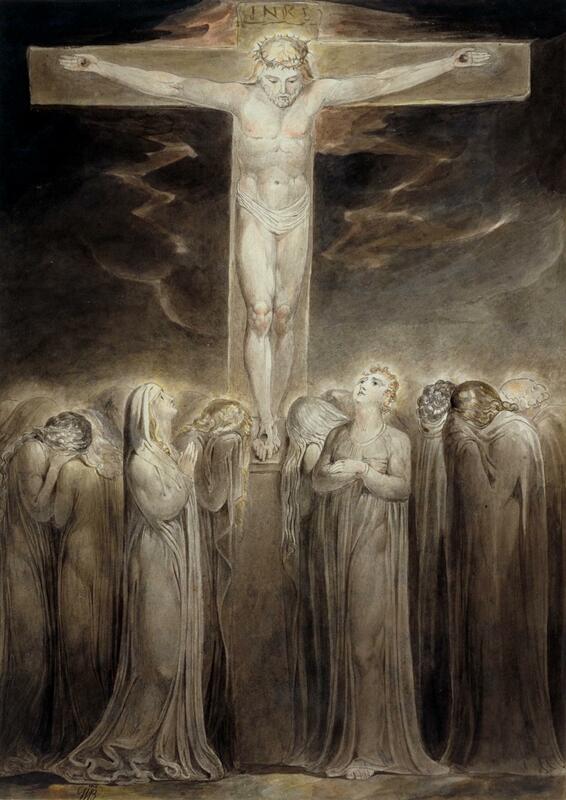 In this article, I’d like to take a quick tour through some of Blake’s paintings which show the strongest influence from design, rather than just composition. There are many others, but these are among my favourites. 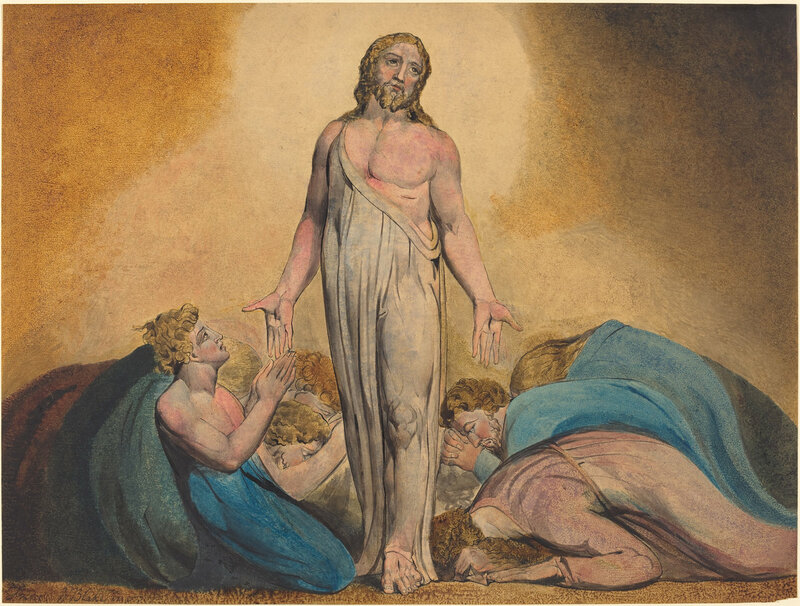 William Blake (1757–1827), Christ Appearing to His Disciples After the Resurrection (c 1795), color print (monotype), hand-colored with watercolor and tempera, 43.2 x 57.5 cm, The National Gallery of Art (Rosenwald Collection), Washington, DC. Courtesy of The National Gallery of Art. And as they thus spake, Jesus himself stood in the midst of them, and saith unto them, “Peace be unto you.” But they were terrified and affrighted, and supposed that they had seen a spirit. And he said unto them, “Why are ye troubled? and why do thoughts arise in your hearts? Behold my hands and my feet, that it is I myself: handle me, and see; for a spirit hath not flesh and bones, as ye see me have.” And when he had thus spoken, he shewed them his hands and his feet. And the son of an Israelitish woman, whose father was an Egyptian, went out among the children of Israel: and this son of the Israelitish woman and a man of Israel strove together in the camp; and the Israelitish woman’s son blasphemed the name of the Lord, and cursed. And they brought him unto Moses: (and his mother’s name was Shelomith, the daughter of Dibri, of the tribe of Dan:) and they put him in ward, that the mind of the Lord might be shewed them. Then saith he to the disciple, “Behold thy mother!” And from that hour that disciple took her unto his own home. 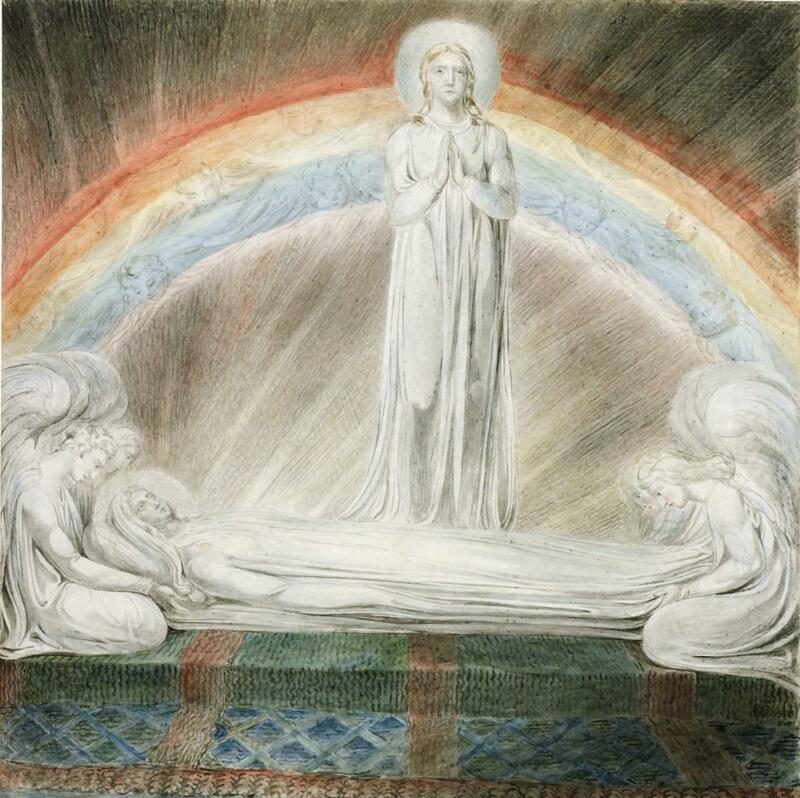 Its rainbow is painted in the correct, Newtonian order, suggesting that it was painted before Blake switched to inverted rainbows in about 1803. Thou art the anointed cherub that covereth; and I have set thee so: thou wast upon the holy mountain of God; thou hast walked up and down in the midst of the stones of fire. Thou wast perfect in thy ways from the day that thou wast created, till iniquity was found in thee. When Jesus therefore saw his mother, and the disciple standing by, whom he loved, he saith unto his mother, “Woman, behold thy son!” Then saith he to the disciple, “Behold thy mother!” And from that hour that disciple took her unto his own home. And he took it [the body of Jesus] down, and wrapped it in linen, and laid it in a sepulchre that was hewn in stone, wherein never man before was laid. 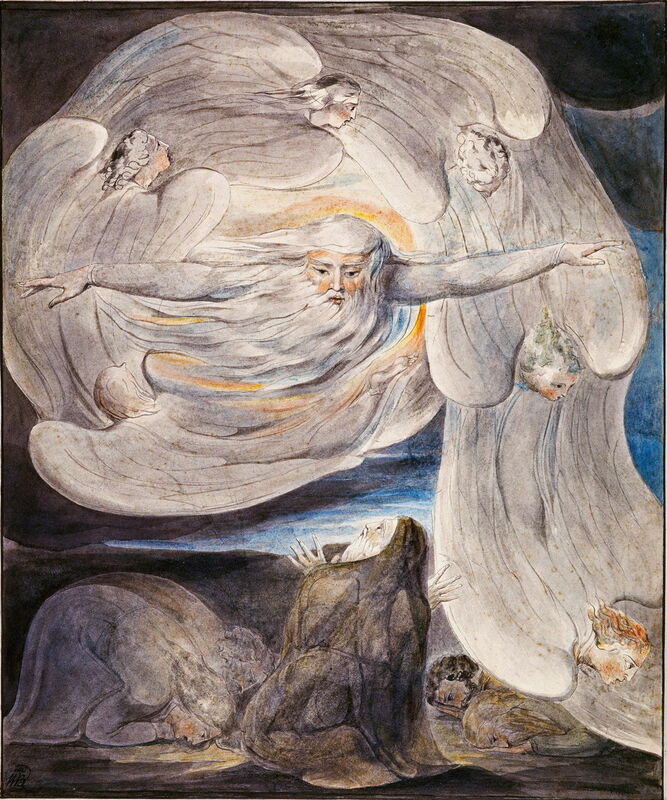 William Blake (1757–1827), Job Confessing his Presumption to God who Answers from the Whirlwind (c 1803-5), pen, ink and watercolour over pencil on paper, 39.3 x 33 cm, The National Gallery of Scotland, Edinburgh, Scotland. Wikimedia Commons. And immediately I was in the spirit: and, behold, a throne was set in heaven, and one sat on the throne. And he that sat was to look upon like a jasper and a sardine stone: and there was a rainbow round about the throne, in sight like unto an emerald. And round about the throne were four and twenty seats: and upon the seats I saw four and twenty elders sitting, clothed in white raiment; and they had on their heads crowns of gold. And out of the throne proceeded lightnings and thunderings and voices: and there were seven lamps of fire burning before the throne, which are the seven Spirits of God. And before the throne there was a sea of glass like unto crystal: and in the midst of the throne, and round about the throne, were four beasts full of eyes before and behind. And the first beast was like a lion, and the second beast like a calf, and the third beast had a face as a man, and the fourth beast was like a flying eagle. This appears to have been painted after about 1803, as its rainbow is reversed. And Jacob awaked out of his sleep, and he said, Surely the Lord is in this place; and I knew it not. And he was afraid, and said, How dreadful is this place! this is none other but the house of God, and this is the gate of heaven. And Jacob rose up early in the morning, and took the stone that he had put for his pillows, and set it up for a pillar, and poured oil upon the top of it. And he called the name of that place Bethel: but the name of that city was called Luz at the first. 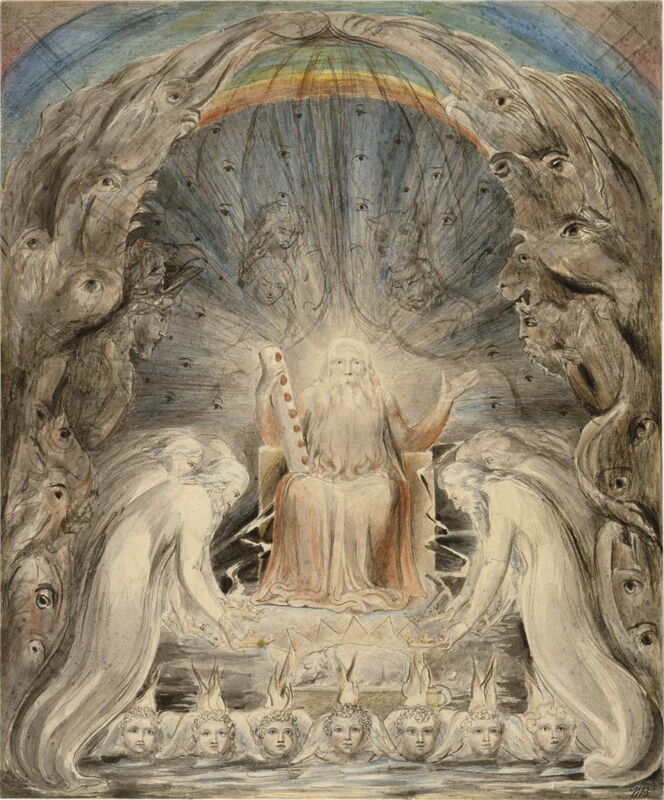 William Blake (1757–1827), Satan Watching the Endearments of Adam and Eve (1808), pen and watercolour on paper, 50.7 x 38.2 cm, The Museum of Fine Arts, Boston, MA. Wikimedia Commons. 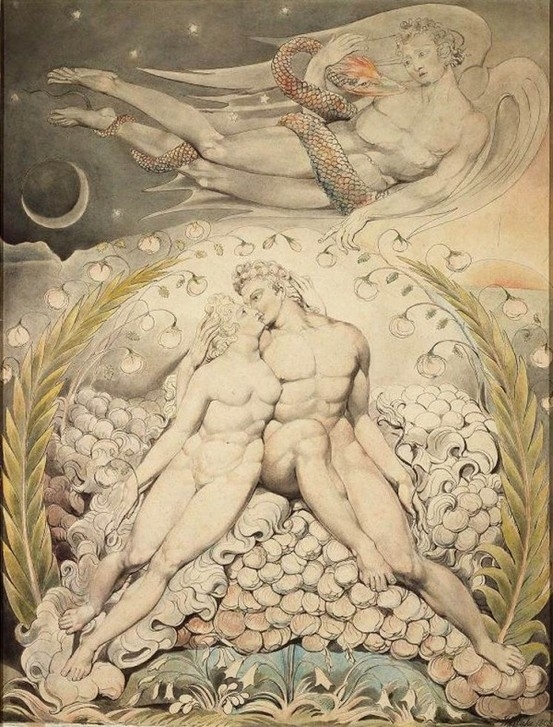 Satan Watching the Endearments of Adam and Eve (1808) is from Blake’s slightly later illustrations to Milton’s Paradise Lost, and refers to book 4, lines 325-535. 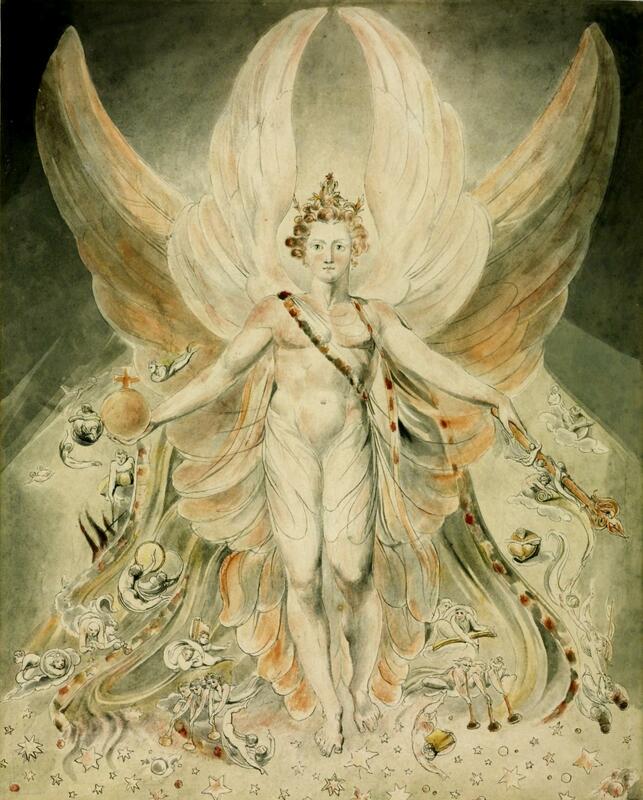 Blake painted several slight variations of this work, each based on the same strong design. 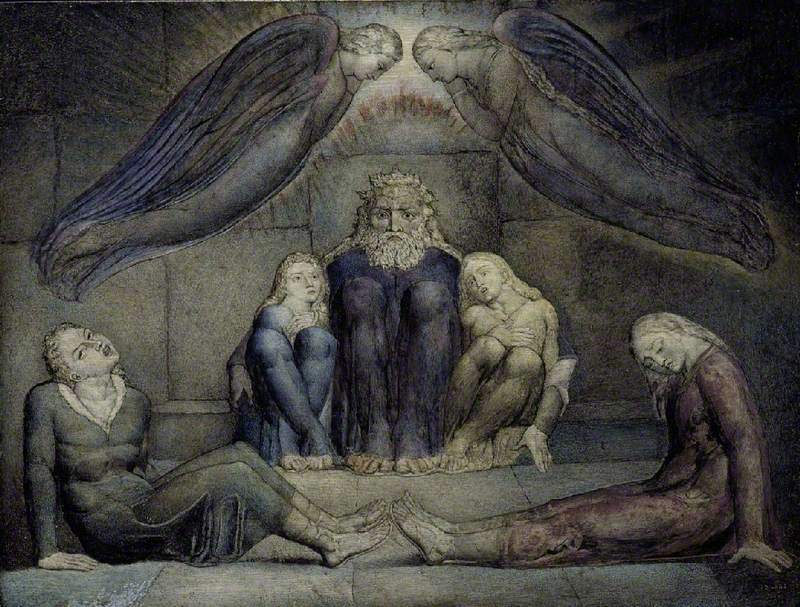 William Blake (1757–1827), Count Ugolino and His Sons in Prison (c 1826), pen, tempera and gold on panel, 32.7 x 43 cm, Fitzwilliam Museum, University of Cambridge, Cambridge, England. The Athenaeum. 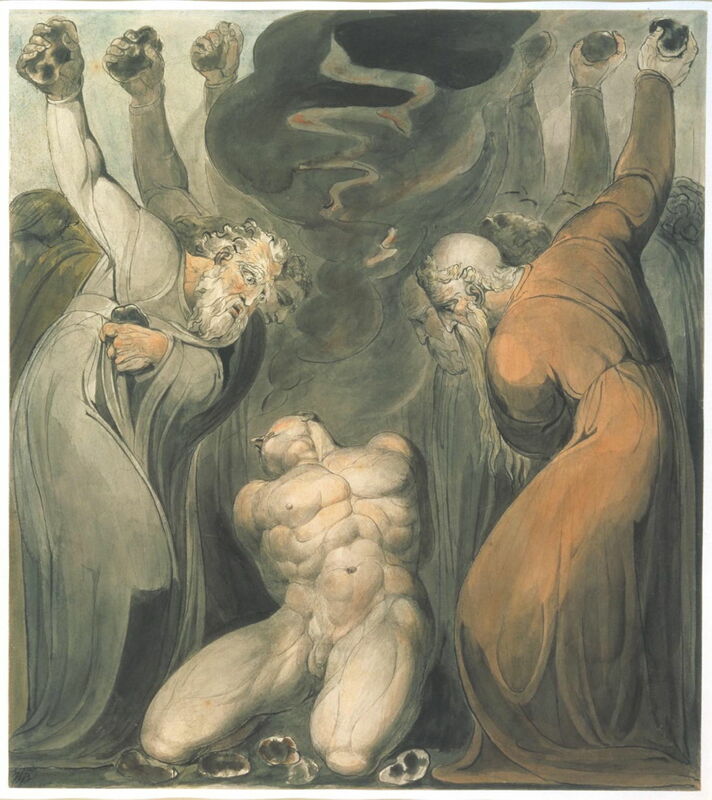 My final selection is not a traditional watercolour, but one of Blake’s late glue tempera paintings, Count Ugolino and His Sons in Prison (c 1826). This refers to Dante’s Inferno, canto 33 verses 43-75. 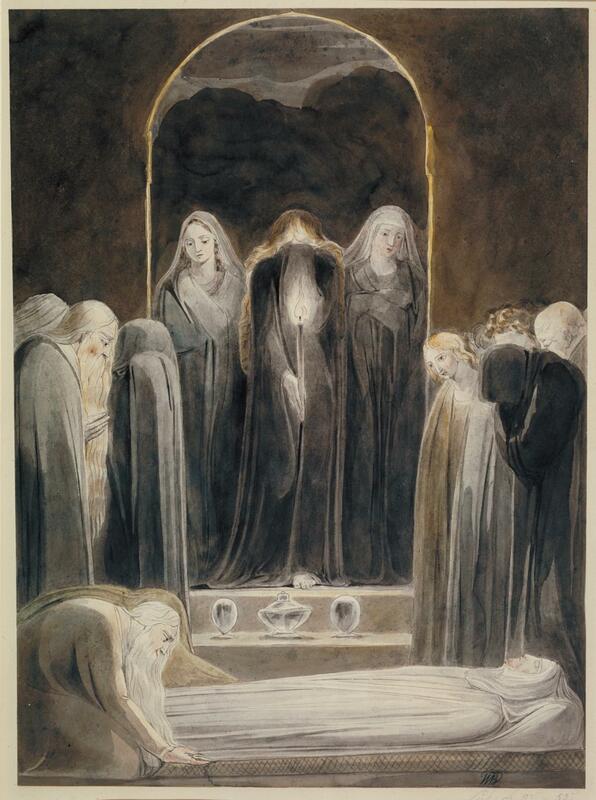 Blake had also planned to incorporate a similar painting in his illustrations to Dante, which he was working on at the time of his death. In that series, the image exists only as a pencil sketch. 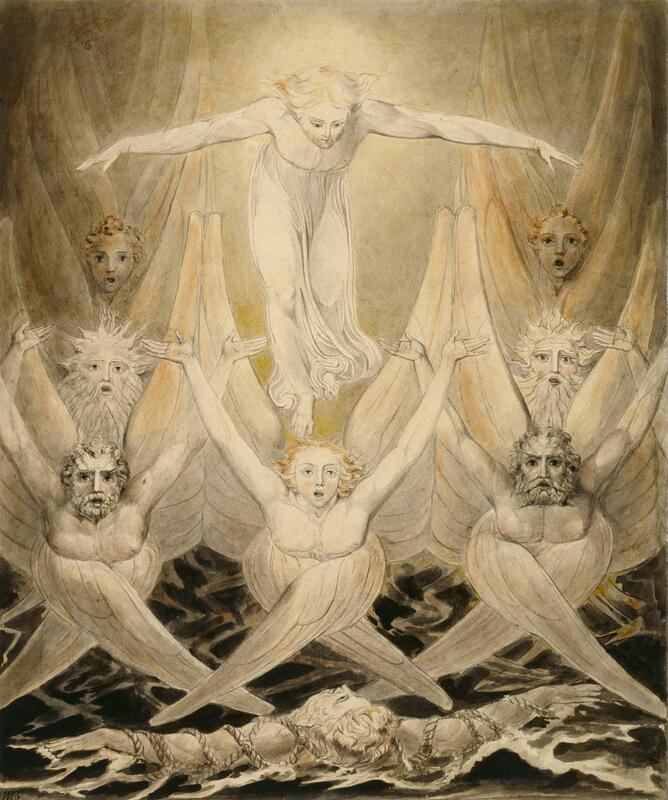 Blake’s artistic design had limited influence over other painters during the nineteenth century, but was a much greater influence on twentieth century visual art. Posted in General, Painting and tagged Blake, design, painting. Bookmark the permalink.